Your little girl will look gorgeous for her birthday photos in this adorable red and black personalized ladybug birthday tutu set. This set is pictured with a number 1, but You may personalize your set by having any Age, Initial or Name added. 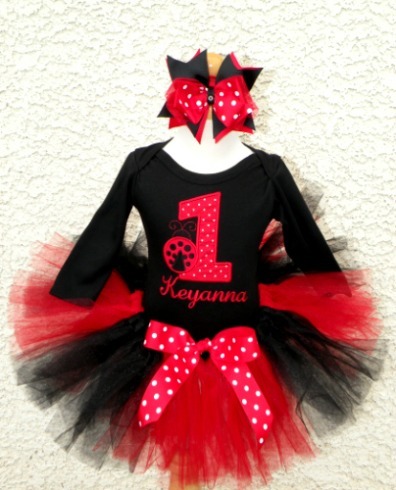 The Red and Black Ladybug Birthday Tutu Outfit set comes with a Personalized onesie or shirt, a matching Tutu, and a matching Headband Bow, or the option ofÂ 1 orÂ 2Â Hair Clip Bows. This item is custom made in the US. Please allow up to 10 business days for your order to be created, plus shipping time. If you choose the overnight sihpping option. Order must be placed before 2:00 pm EST in order for you to receive it the next day. If placed after 2:00pm EST you will receive it within 2 days.